This May Iskratel Startup was participating at the international startup conference PODIM held in Maribor, Slovenia. At this year’s event, there were over 1,000 participants from all over the world, more specifically, from 25 different countries, including more than 300 representatives of startups, 90 domestic and international investors, more than 100 representatives of corporations from Slovenia and from abroad, as well as more than 70 established speakers. Based on 25 meeting with the startups at the conference, Iskratel Startup has selected startup DSM Meritve ─ solution Second Generation Grid, as the most compatible solution for Iskratel’s Energy vertical. The solution Second Generation Grid presents a comprehensive system for collecting, transmitting and processing energy and water consumption data. As a corporate partner at the conference, Iskratel was honored to be visited by one of the speakers at the PODIM conference, Mr. Henry Hwong from USA. Henry is an experienced executive director in IT and marketing strategies. He represents consulting company Cunningham Collective in San Francisco. One of the founders of Cunningham Collective, Andy Cunningham, collaborated with Steve Jobs and in 1983, as part of the team who launched the first world’s Macintosh. 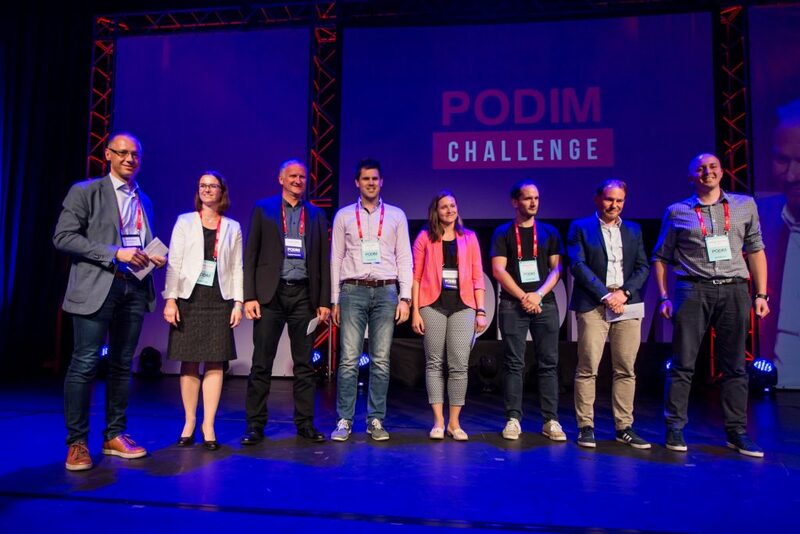 Photo: Representatives of corporate startup programs with the selected startup winner of PODIM Challenge.